It may have taken me eight years to watch The Social Network, but at least I’d heard of it before that. I’m amazed that I only heard about the side-by-side Brooklands Museum and Mercedes-Benz World when I was Googling around for things to do a couple of months ago! Located just a 15-minute walk from Weybridge station, which itself is only a half-hour journey from London Waterloo, the Brooklands Museum has a considerable collection of planes and cars, including a Senna-era McLaren (which unfortunately only kids are allowed to sit in). The centrepiece, though, is without doubt the Concorde that sits in the middle of the tarmac. For a small supplement (starting from £5), you can explore the on-board exhibition, take a look at the cockpit, and take your seat for a flight experience – all accompanied by fascinating facts about the story and engineering feats behind the aircraft. 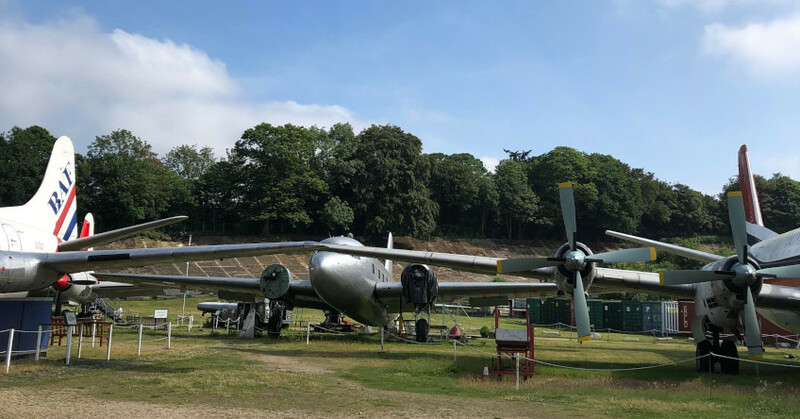 The Brooklands Museum was great – for the £15 entry fee you could easily spend a full day exploring its exhibits, which span several hangars and garages. It also really embraces the retro vibe, with old-timey music playing, restored petrol pumps from yesteryear, and visitors bringing along their beautiful old cars and posing for photos. We were also lucky enough to have picked a gorgeous day to take a walk around the old racing circuit banking. Just over the fence is Mercedes-Benz World, which was a little disappointing, but still worth a short visit while you’re in the area – especially if you’re interested in the driving experiences. 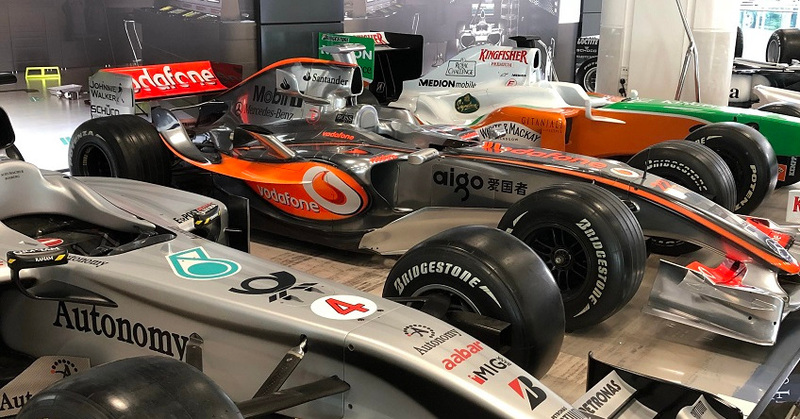 Most of the building is a glorified showroom, but there are some cars of interest around, including a collection of Mercedes-powered F1 cars (an early modern-era Mercedes, a Force India, and McLarens that would have been driven by Lewis Hamilton and Mika Hakkinen). 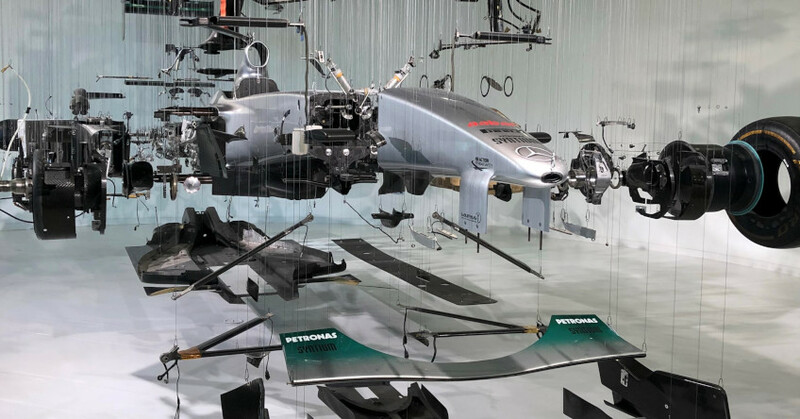 The temporary exhibition when I visited a championship-winning Mercedes Formula 1 car stripped of all its parts, which were suspended from the ceiling to give an exploded view of its inner components – fascinating to take a look at. There was also a simulator area, although a turn on the full-size F1 version would set you back £10. On the subject of expenses, I’d recommend lunch at the Brooklands Museum if you’re hungry. Its cafe was half the price of the one at Mercedes-Benz World (if that), and the food was delicious and delivered in generous portions in the more lively retro surroundings. All in all, Weybridge is a great day out for anyone interested in cars, aviation, and engineering, and well worth the short trip from Waterloo for any Londoners frustrated at the lack of motor museums in the capital. It’s also a great chance to take a look at F1 cars from different eras (I counted seven between the two museums in total). A highly recommended visit!